You're right, it seems black cords are tough to find in stores. But they are made, I know because I've seen them. I even have one black store-bought cord. It's 15' long, either 14 or 16 ga, with molded ends. But that's not one that travels with me, it's in the same place as all my orange and yellow molded end cords, and those only get used at home. Most of the cords I carry I made myself, with 500' of 12/3 SO. 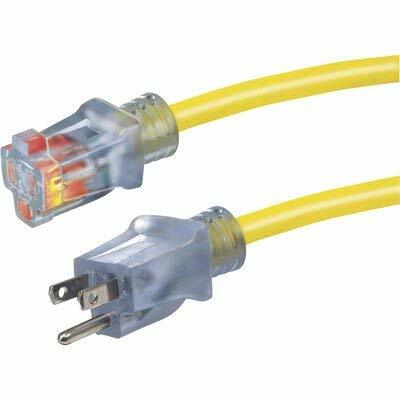 I carry 2 manufactured cables, the kind with the lit outlets every few feet down the cable. I think they're from CBI, but I can't remember anymore. The only cables I have that aren't black are 2 power strips, that get used only rarely, like when a guitar player forgets to bring their own stuff. Oh well, at least the power strips are mostly black, but the cable on them is yellow. But it doesn't matter, they hardly ever leave the case. I recommend getting yourself some 12/3 or 14/3 and making all the cords you need. Once you break it down it doesn't cost all that much, and you'll have really durable cables that will serve you for many years. Plus they're black, and that's a good thing. Tell him he's nothing without glowing neon lamps at the female ends of his hot yellow power cables. Maybe he could put on a light show by swinging them in circles. Yahooooo! P.S. to the youngsters: "yahoo" used to mean hick or hillbilly. The sound of it being yelled was used in ads to sell Mountain Dew back in 1965. "...It'll tickle your innards!" Wow, it must be tough hiding all that yellow and orange stuff in the truss! We wear black suits. Do you go to events (that require suits) in neon orange or pink suits? that's a llittle extreme, but think about it. anyway, enough rambling for me. I yell at folks who insulate with electical tape rather than shrink. Colored power cords would fall under this form of bigotry. If someone send me a roll of black 10/3, say 500', I would make up all black power cards and "be the theater". How come that never works on this site? How many Thespian hours do I get for making "proper" extenders? Right after a couple mics, a cool new Rane Parametric, a couple more amps, and another sub. Tom "But if you close your eyes, it still sounds as good"
I make nearly all of my own AC extensions out of black 12/3 with black-and-white explosion-proof safety ends. I also make my own twofers and fourfers out of similar high-grade components. I learned what I do from doing theatre electric work before I did sound--anything non-black sticks out like a sore thumb on an electric over the stage or out in the house. My advice to anyone doing this, though, is to make absolutely sure that you wire things with some modicum of a standard! Simple things like "white wire to white screw" and "make sure your grounds are bonded" seem to escape far too many. A few assistants have been unpleasantly surprised by using a piece of electrical gear that they built without paying attention, and a few times *I* have been surprised by their work (nothing like grabbing a "hot" batten 30 feet in the air to wake one up). All that said, I do have a few brightly-colored extensions in the bin to run during outdoor shows, and I have a few white mic cables that some "roaming" vocalists prefer to help keep them from tripping over their own cord on a dark stage. EWI Amps? 1000's, or 2000's? I like the fan cutout with battered fingerguard in the middle of that other roadcase, BTW.. I Have 3 12/3 extension cords for main power, 2 yellow ones, one 25 and one 100 feet, and a new orange one that's 85 feet long and bright neon orange, but damn, for $30 with a 2' 12/3 3 outlet splitter included i couldn't pass it up. for stage power and runs to foh i use your standard 16/3 orange extension cord. thing is most venues I work couldn't care less, and my cables are typically routed along walls and under gaff tape so nobody notices them anyway. as for my FOH it is very neat. 1 snake loomed with mesh goes from rack to board with a 1.5' fanout on the end, 2 power cables from the rack, one to board and one to the wall, and one xlr jack on the back to the amp racks. all cables on fanout are labled. My mixer case also has a small half-doghouse on the back. I am pretty picky about keeping things organized at foh and don't like having a bunch of misc. crap laying around. almost all of my racks have i/o panels on them or i am sure to pile the cables behind them out of view. Mic cables are all black, they get stored in the left half of my cable bag, speaker cables on the right all neatly wrapped and tied with velcro. That's about all i can think of with my rig.